Bookmarks in your web browser can be powerful tools for repeated use in your research. 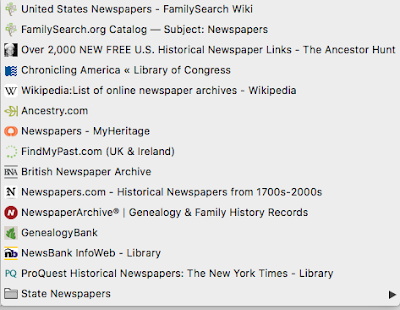 We discussed methods for organizing your bookmarks in Episode # 345 of The Genealogy Guys Podcast. Here's an example of how George organized his bookmarks for Newspapers. He has a high level bookmark in his Chrome browser's Bookmarks Bar called Genealogy. 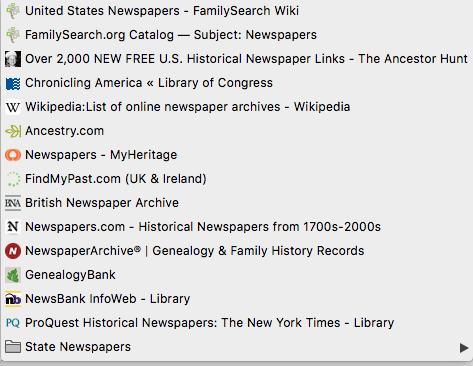 Within Genealogy, he has individual bookmarks and folders of like category bookmarks. In this case, he has clustered all of his most-used newspaper resources into a Newspapers folder. By clustering bookmarks into folders of like resources, they are much more easily located when you want them. Having al the resources together also helps insure that you see your whole collection of suggested bookmarks and don't omit any. Consider creating cluster folders of bookmarks for any category, such as Census, Immigration, Naturalization, Military, etc. Within the Census folder, you might create sub-folders for US, Canada, UK, and for various states' censuses. You might create sub-folders for Military for American Revolution, Civil War, World War I, World War II, Korean War, Vietnam War, etc., and file bookmarks related to specific conflict there. Don't forget that a bookmark can be replicated in multiple folders and sub-folders. 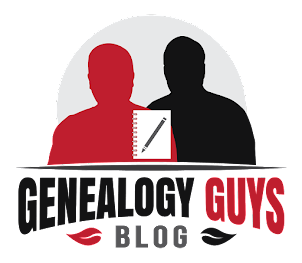 Listen to Episode # 345 of The Genealogy Guys Podcast for more details about organizing your bookmarks for success! Thanks for the post and reminder about getting bookmarks organized. Years ago I got that started and fortunately those bookmarks usually follow when you have to break in a new computer. But right now I have a very lengthy string of bookmarks with no home. Time to put them in their place!